In previous versions of MVC, we used Child Actions to build reusable components / widgets that consisted of both Razor markup and some backend logic. The backend logic was implemented as a controller action and typically marked with a [ChildActionOnly] attribute. Child actions are extremely useful but as some have pointed out, it is easy to shoot yourself in the foot. Child Actions do not exist in ASP.NET Core MVC. Instead, we are encouraged to use the new View Component feature to support this use case. Conceptually, view components are a lot like child actions but they are a lighter weight and no longer involve the lifecycle and pipeline related to a controller. Before we get into the differences, let’s take a look at a simple example. View components are made up of 2 parts: A view component class and a razor view. To implement the view component class, inherit from the base ViewComponent and implement an Invoke or InvokeAsync method. This class can be anywhere in your project. A common convention is to place them in a ViewComponents folder. 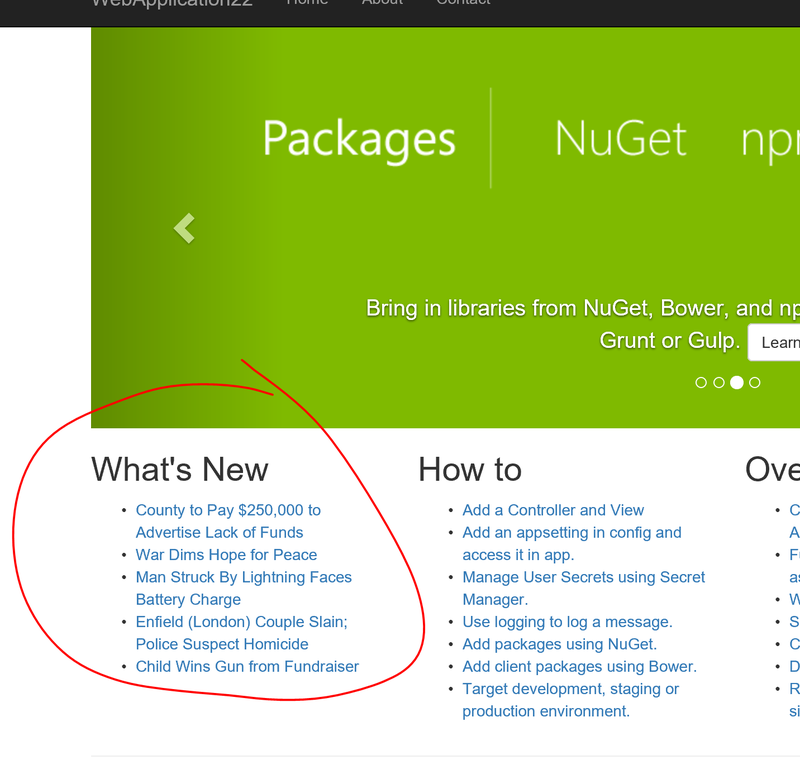 Here is an example of a simple view component that retrieves a list of articles to display in a What’s New section. Much like a controller action, the Invoke method of a view component simply returns a view. If no view name is explicitly specified, the default Views\Shared\Components\ViewComponentName\Default.cshtml is used. In this case, Views\Shared\Components\WhatsNew\Default.cshtml. Note there are a ton of conventions used in view components. I will be covering these in a future blog post. The first parameter to @Component.InvokeAsync is the name of the view component. The second parameter is an object specifying the names and values of arguments matching the parmeters of the Invoke method in the view component. In this case, we specified a single int named numberOfItems, which matches the Invoke(int numberOfItems) method of the WhatsNewViewComponent class. So far this doesn’t really look any different from what we had with Child Actions. There are however some major differences here. With view components, parameters are passed directly to your view component when you call @Component.Invoke() or @Component.InvokeAsync() in your view. There is no model binding needed here since the parameters are not coming from the HTTP request. You are calling the view component directly using C#. No model binding means you can have overloaded Invoke methods with different parameter types. This is something you can’t do in controllers. View components don’t take part in the controller lifecycle. This means you can’t add action filters to a view component. While this might sound like a limitation, it is actually an area that caused problems for a lot of people. Adding an action filter to a child action would sometimes have unintended consequences when the child action was called from certain locations. A view component never directly handles an HTTP request so you can’t call directly to a view component from the client side. You will need to wrap the view component with a controller if your application requires this behaviour. Most notably, you can access information about the current user from the User property and information about the current request from the Request property. Also, route information can be accessed from the RouteData property. You also have the ViewBag and ViewData. Note that the ViewBag / ViewData are shared with the controller. If you set ViewBag property in your controller action, that property will be available in any ViewComponent that is invoked by that controller action’s view. Like controllers, view components also take part in dependency injection so any other information you need can simply be injected to the view component. In the example above, we injected the IArticleService that allowed us to access articles form some remote source. Anything that you could inject into a controller can also be injected into a view component. View components are a powerful new feature for creating reusable widgets in ASP.NET Core MVC. Consider using View Components any time you have complex rendering logic that also requires some backend logic.